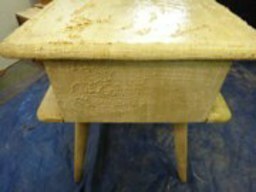 In our continuing search for non-toxic materials and products, we have recently started using a soy stripper to remove old paint and finishes from wood furniture. Because of its low odor, and biodegradability, and effectiveness quality, Soy Gel Paint Stripper has become our go to stripper. It is available at woodworking stores and environmentally conscious paint stores. 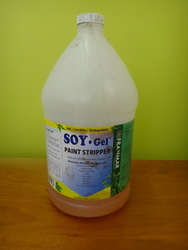 Despite Soy Stripper’s lower toxicity, be sure to wear rubber gloves and provide yourself with some ventilation. Apply the stripper with a brush (those cheap disposable ones) so the surface is fairly wet. The longer it sits, the more it removes, but we have found it to work quickly. We routinely remove the used stripper from one area of the piece to another to extend the life of the product. This works fairly well although at some point the used stripper begins to lose its effectiveness and you will need to apply some fresh product. After scraping off most of the stripper, you can remove the residue with a scotch bright pad or a medium grade steel wool. Keep going over it until it is clean. Let it dry at least a day and then sand. Start with a medium grade (about #150) and then finish with a finer grade (about #220). 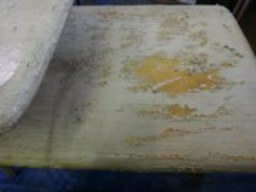 You are now ready to apply your choice of stain or urethane after you have thoroughly cleaned off the sanding dust with a tack cloth or damp rag. We will be reviewing water based stains next.